Father went up the Limpopo, Mother went up the wall – I’m going up the Llangollen #narrowboat #England – The Diesel-Electric Elephant Company. Dash it all, Doris, a chap has to do what a chap has to do. If what a chap has to do includes invading Wales in a 57′ narrowboat floating on just about an inch of water then so be it. Full steam ahead, Mr Floggemall-Senseless, and damn the torpedoes. The Llangollen Canal lays plausible claim to being England’s most scenery-infested canal, and while not the busiest in absolute terms it is populated from source to estuary by a single, vast shoal of insane, explorer-eating piranha tourists. The canal was completed at about four-thirty pm in the afternoon, in the days when scraggy-arsed urchins knew their place in society and when thruppence bought an acre of land suitable for the growing of cardoons, medlars and nasturtium tubers. History tells us the canal was built by William Jessop, Thomas Telford and Bert Scroggins, but I rather suspect that of the three, only Bert ever picked up a pickaxe and spade. The canal is some forty-one miles in length and, having cruised up it, I can tell you that it will be lovely when they get around to putting some water in it… we scraped bottom all the way, and indeed are still scraping bottom on the return. It’s playing hell with the Cardinal’s barnacles, and it’s not doing my nerves a power of good either. On the 4th of July in the Year of Our (Increasing) Lard 2017, I victualled the boat, topped off the fuel tanks and cast asunder the contents of Thunderbirds I, II, III & IV into the redoubtable CaRT services at Calveley. Favourable winds and tides saw me present myself and Cardinal Wolsey the day following, the 5th, at yonder The Barbridge Inn, in order to press a suitable crew (the long-suffering brother in this instance). As luck would have it, a brief berth was available not some six or seven yards from the “horseless carriage parking area”. each of which significances I shall, in due course, describe along with the other delights and attractions of our foray into the far-flung flummeries of England and over the Welsh border. So far we have recorded a (slightly misleading) forty-one miles, twenty-one locks, three tunnels and two aqueducts, a total otherwise known as “seventy-three Aspirin and two bottles of gin”. Here though I shall merely introduce our first day, some seven miles and nine locks, ending with a rabbit in a tree and Westminster Chimes. It is a sad but as yet undeniable fact of “the science, yes indeed, Myffanwy”, that water will not remain for long on a convenient slope, and thus a devilish device known as “a lock” is required on canals in order to cope with the vagaries of the English and Welsh landscapes. A lock is a chamber between two canals of varying altitude, with gates at either end, into which water is sent apace or from which it is drained, to facilitate the passage of a boat. There are various designs, but they all include danger abounding, paddles that require winding up and down and a level of physical activity that I have not seen since my days as a prize-fighter for the honour of the Chota Nagpore Mounted Rifles. Ordinarily, I tackle these in my role as Billy No-Mates on my own, but with a crew aboard we were able to split the tasks. Holding the boat on the lock landing, moving aforesaid boat into the lock, keeping it positioned, removing the boat and temporarily re-mooring on the “other side” of the lock fell to be handled by one party of the part, while setting the lock for passage and then leaving it in the proper state fell to the other. …and we rise to the next level. Mother always said that I would. Nine times that day under the blazing sun and the relentless attack of vampire-horseflies we performed this procedure, although by the close it seemed we had done so nine times nine. Our spirits good (Hendricks) we saw off Hurleston Locks, Swanley Locks and Baddiley Locks, goodily. …and we saw narrows made by man’s neglect, formed by Hungarian Knee-Cap Weed, or some such (forgive me, I do not know the Latin). Once through the notorious locks we came then upon the Land of the Lift Bridges. These are, as the name suggests, bridges requiring a cove to leap ashore from his vessel and raise them manually, usually by many cranks of the windlass upon some dastardly hydraulic mechanism designed by Mr Heath Robinson and maintained, it sometimes seems, by Mr N O’body. We took turns at these too, occasionally even taking funny turns, since one such mechanism required no fewer than eighty-two muscular cranks of the windlass to raise and lower the beast. Eventually we came upon one lift bridge too many, the lift-bridge that resembled the dried stalk of grain that seriously interfered with the smooth operation of the dromedary’s vertebrae, and we moored for the night near Wrenbury. Anyone who has ever been anyone has, at some time during their lives, moored at Wrenbury. 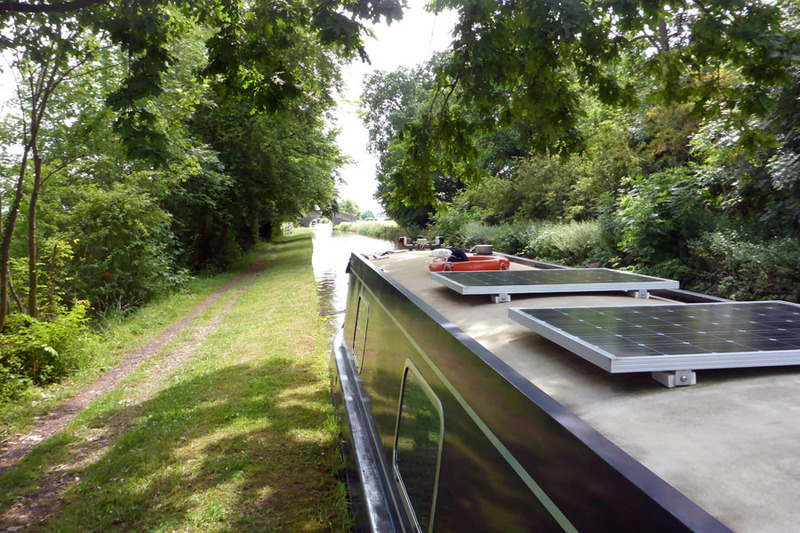 Two features almost immediately struck us about our choice of moorings, and these were not, as you may have first thought, overhanging branches. No, the first feature was the discovery of a dead rabbit six foot up in a tree. A native warning perhaps, or just a wild tree-rabbit that had lost its footing and fallen from its warren in the higher branches? We shall likely never know. Not even little Didwe knew, and we called repeatedly into the engine bay for enlightenment. The second feature of note here was a regular and most delicate Westminster chime echoing about the place. After some discussion we took this to be not some indication of a perverse fold in space and time putting us into unholy juxtaposition with the Seat of Government, but merely the proximity of some country church that had retained its tower and clock. We formed the opinion that the presence of the latter, the church, would cancel out the presence of the former, the dead tree-rabbit, should the latter prove indeed to be a native threat to mooring boaters. Being the innocents abroad that we are, we slept well on Day 1, having no sense of the damned-near total, damned-near permanent, damned-near fatal disaster that Day 2 would bring. More of – indeed all of – Day 2 in the next post. For the moment though I shall simply leave you with a splendid chimney construction that we spotted en route. It is surely either the work of a bricklayer with an inner-ear infection, or the result of a healthy bricklayer working during a persistent whirlwind. Either way, it’s rather fantastic, don’t you think? Yes, yes indeed – but we’re all FAR too polite to allude to that, aren’t we. Chin-chin, chaps, for the moment. Ian H., accompanied on this occasion by the “The Bro”. Life can be so crew’ll. Tomorrow, it ruddy nearly was, if you’ll pardon the peculiar use of tenses. Oh. Dear. Rabbits in Trees must certainly be an omen of… Something. Of course that is the peculiar flaw of omens, they are rarely quite as transparent as we later wish they were. I imagine you discovered what rather later than it would have been helpful to know. Still. It does add a certain flavor to an adventure. I mean, honestly, what would this quest be without a proper omen? I posit it would merely be expected, efficient and utterly humdrum. No one wants that in a good story. I must say that the Cardinal is a very smart creature. Phew! That sounded like hard work and I’ve not heard the harrowing bit yet. You do have a way with history that appeals. Excellent stuff!